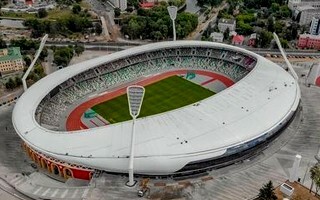 Just as contracted, works on the construction site have officially ended on May 31 and now preparations for the official opening are ongoing at the brand new Stadion Dinama in Minsk. It should be noted, however, that we're talking about the amended contract, not initial one. Initially the stadium was due for delivery on May 31... of 2017. Since then works were extended twice to allow delivery of all elements, despite a large number of workers and companies (up to 1,800 and 100, respectively) reportedly carrying out daily tasks. Even now you can see people doing work inside, though now it's mostly about clearing the site and preparing event infrastructure. On June 22 the very first match will take place since the former Stadion Dinama closed its doors back in 2014. We're not talking football, rather an athletics match, as it's called locally. The international track and field tournament is expected to draw crowds, also facilitated by the fact that tickets are quite cheap, between 5 and 7 ruble (or $2.5 – 3.5). While tickets aren't expensive, the stadium is quite the opposite. Official data informs about public spending of $200 million, which is really steep for a 22,000-seater, in any country. Even more, that's the price for which you see stadia of 40,000+ delivered in Germany. You can thus sense the irony of the Belarusian authorities having rejected a project from GMP Architekten that would have seen 40,000 seats in the old-new stadium for an estimated €180 million (initial figure was €120m, later amended). To make it even more controversial, the Belarusian media outlet Solidarnast reveals that authorities in Minsk have spent a stunning €190,000 on VIP sofas alone, also more than in many western arenas. However, we should also be fair and note that the new Stadion Dinama is a really challenging project and its price, well above average, is understandable at least to some extent. From demolition of the old one to delivery of the new one, a major obstacle was observed. Its historical outer walls had to be preserved, as well as monumental 'Roman' gate in the north, monument of runners in the south and the Olympic torch inside. The latter one was removed and installed in a different part of the new stadium, but features like these always cause additional cost. Should it be enough to reach $200 million? Presumably not, especially for a stadium that doesn't even cover all spectators from the elements, even if the hospitality area is more than cosy.